Olof Häggström is taking the #MicroCanning revolution we started and spreading it across his homeland of Sweden. Olof’s Can Man company — the country’s first mobile micro-canner — counts exclusively on Cask Global Canning Solutions canning systems to power its far-north endeavor. This video showcases Can Man and the bennies of Cask systems for one of Can Man’s customers, Nordic Kiwi Brewers. Founded by Kiwis Kerryn Beattie and Craig Donovan, the brewery showcases New Zealand hops in a range of canned beers made for Sweden’s growing (and pro-cans) craft beer audience. Our favorite parts of this video? 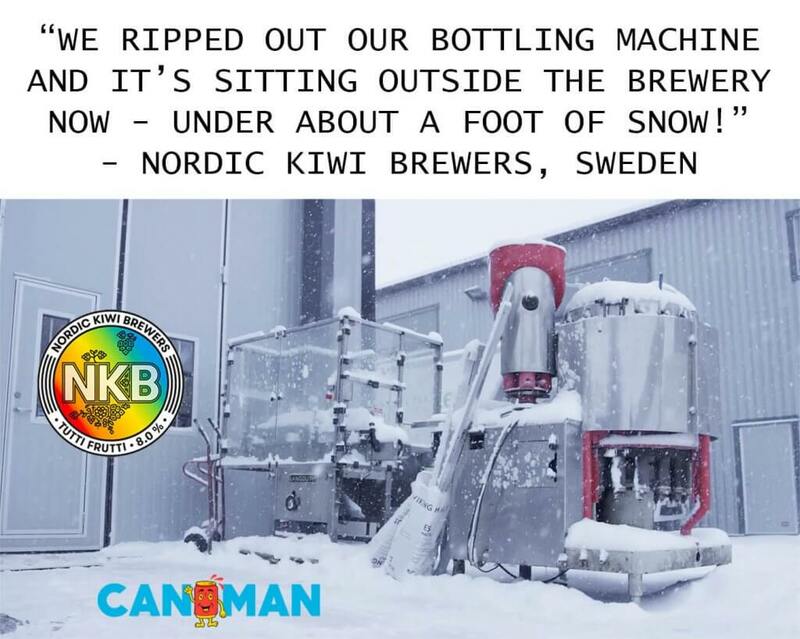 The raves for our across-the-globe customer service and super-low levels of dissolved oxygen pickup, and a sad-but-true shot of NKB’s now-retired bottling line gathering snow outside the brewery. Why Should Mobile Canners Roll with Cask? Heavy duty castor wheels and a small overall footprint make Cask systems easily portable via a small trailer. Simple change over between any size of Slim, Sleek or Standard diameter can enables packaging of multiple beverages (beer, cold brew coffee, wine, kombucha, sodas and more) with a single machine. System speeds from 25 to 40 cans/minute or 63 to 100 cases/hour. Electric cam driven seamer significantly increases seam integrity by removing variability of pneumatic seamers. Systems are designed for nitrogen dosing. Built-in technology regulates “dose-to-seam” time to ensure consistent nitrogen dosing in every can. An inline scale and auto-reject has the dual benefit of reducing post-packaging labour by one person as well as ensuring perfect fill levels. Systems require only single-phase power and are designed for minimal compressed air consumption.